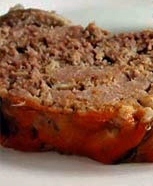 If I had to name my favourite meals, meat loaf would definitely be on the list. There are several ways you can make this great, inexpensive entree, but did you know that you can also make it in a slow cooker? I tried it and it was really good – and it took very little time to put together. I made some homemade gravy with it, using stock I have in the freezer form previous cooking adventures and of course, serves it with mashed potatoes (made with cream cheese and chives) and glazed baby carrots. What can I tell you – on a grey, cold, snowy winter evening…. perfect comfort food makes it all better! Mix first 9 ingredients in large bowl. Add ground beef and ground pork. Press ½ of meat mixture into bottom of greased 5 quart (5 L) slow cooker. Spread with cheese. Press second ½ of meat mixture over top. Cover. Cook on Low for 10 to 11 hours or on High for 5 to 5 ½ hours. Smooth ketchup over meat mixture during last hour of cooking. Enjoy and send in your comments, suggestions and pictures if you have them – your input is always welcomed and very much appreciated!